If you are looking for a quick and easy crochet craft for Valentine's Day or to incorporate into other projects, these cute little crochet hearts are perfect. 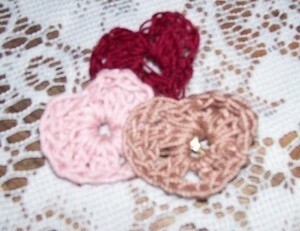 This page contains the instructions for making a crocheted heart pin. These cute little heart pins are a perfect gift for your co-workers or any one you would like to say "Be my Valentine" too. They are quick and easy and could easily be made up for a party gift or be made for the residents of a nursing home for Valentine's Day. These are made on the same principal as a granny square. You are forming a shell stitch with the triple crochets at the top and forming the point at the bottom with the 2 chain stitches. Time to complete: I made six of these in 2 hours. *These would be even better in the colors of conversation hearts but I wanted to give them a kind of antique look. The pink and mauve color hearts were done in some left over bedspread cotton and the cranberry heart was in thinner thread for a more lacy look. Chain 6 and slip stitch to form ring. Chain 3, (acts as first Triple crochet) 4 triple crochets in ring, slip stitch , 5 triple crochets in ring , 2 double crochets in ring, Chain 2, 2 double crochet in ring, Slip stitch to top of chain 3. Fasten off and work in ends. With hot glue over lap the hearts and with a drop of hot glue, glue together. Glue pin back to the back for a nice lapel pin. What a wonderful gift idea; so often we try to give something small. Thanks for sharing! Thank you for this cute little project. I am going to try this out tonight!